Some claim that it’s the Year of the Canadian. Others believe it to be the year that the elder statesmen of poker made a roaring comeback. But after three final table appearances and now a bracelet win, 2013 could arguably be remembered as the year of up and coming star Loni Harwood. Where do we begin? For one, the New York native has put together one of the most remarkable summers of any woman poker player in WSOP history. Not only did she join Cyndy Violette and two others as the only women to record three final tables in one WSOP, she banked more money than any woman in a single Las Vegas WSOP event ever. Only Annette Obrestad’s 2007 WSOP Europe Main Event victory was worth more. The victory also vaults Harwood into this year’s Player of the Year Hunt. She currently resides in 3rd place, about 110 points behind WSOP Asia Main Event winner Daniel Negreanu and 162 points behind Players Championship winner Matthew Ashton. Before this year, Harwood had banked a whopping $3,000 in WSOP tournaments. But in no way was the young pro’s performance a fluke. Harwood had already won two WSOP Circuit Events and made eight final tables in 2012 and 2013 alone – most of them at smaller stakes events. Harwood’s performance makes her a force to be reckoned with at this year’s Main Event. Let’s just hope she has enough time to register. Event #60, the last small buy-in tournament of the summer, drew an astounding 2,541 entrants and generated nearly $3.5 million in prize money. Although there were no bracelet winners present at the final table, three of the nine participants (including Harwood) had made at least one other final table appearance this summer. But Harwood was hardly fazed by the talent at the table. Employing a hyper-aggressive, tricky style, the 23-year-old faced disaster early at the final table when her A♠K♥ ran into the A♦A♥ of Yngve Steen. But a rivered straight gave Harwood the chip lead and she never looked back. By the time heads-up play began, Harwood enjoyed an over 3-to-1 chip lead over eventual runner-up Yongshuo Zheng. Zheng would fight back valiantly, and at one point cut the deficit to under 2-to-1. But a massive cooler sent Zheng to the rail. In that hand Zheng raised and Harwood called. The flop came down J♣K♥8♣ and Harwood checked to Zhang who fired 250k. Harwood called. The turn brought the J♥ and both players checked. The river was the 10♠. Harwood tried to make her hand look like a bluff by firing out 600k, good for almost 2/3rds of the pot. Zheng shoved and Harwood snapped. Zheng showed A♠Q♦ for the nut straight, but Harwood flipped over the J♦10♦ for a boat. What a cooler! Alright, so Lady Luck was on Harwood’s side, but that doesn’t take anything away from her outstanding performance both today and all throughout the summer. 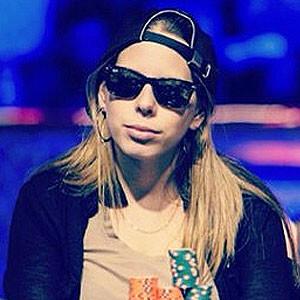 Move over Vanessa Selbst, it looks like poker has a new woman star.